Summary: This ongoing in-water study remains the only in the State of Florida to focus on hawksbill turtles. Since the study's inception in 2004, 143 hawksbills have been tagged and sampled on the reefs adjacent to Central and Northern Palm Beach County. This project, by nature, is a long-term effort. Continued support will help create an increasingly robust database on the population structure, growth rates, and ecology of these endangered turtles. This information is vital to the recovery effort for this species in Florida. 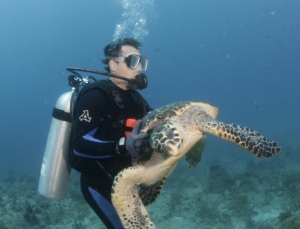 Individual turtles will be hand-captured using SCUBA, retained on a vessel for the collection of morphometric data, tag placement, photographs, and tissue sampling for DNA analysis. A partnership with a local dive operator has made this project both efficient and economical. Frequent sightings of untagged turtles within the study area and the growing opportunity to glean valuable data from recaptures support the continuation of the sampling effort. Results: The hawksbill project in Palm Beach remains quite productive, but field days are limited by weather and wave height conditions. Most of the data over the last year were collected between May and October, 2009. Nonetheless, these data are very valuable, and continue to better describe the size, structure and movement patterns of this aggregation. We continue to encounter primarily sub-adult individuals, of which many have been seen repeatedly by both the P.I. and numerous observers at or near the original capture location. These data continue to reinforce our general understanding of immature hawksbill ecology, and that the reefs of Palm Beach provide suitable, even important, developmental habitat for a robust aggregation of hawksbills. Though final results are still pending, the DNA analyses resulting from the tissue samples have revealed at least 17 Caribbean hawksbill haplotypes represented in the Palm Beach aggregation, with a majority representing Mexican stocks. These results are making a timely contribution to our understanding of the biogeography of Caribbean hawksbills.